All right, time for another boot time competition. It's definitely not the most important aspect of the computer usage, but it can show some rather interesting trends in how an operating system behaves, especially if you can compare successive editions or nearly identical versions. The last time I gave Ubuntu and its family a timely [sic] shakedown was shortly before the spring release, with Oneiric, Kubuntu of the same numerical persuasion and Mint Julia competing on my rather unusual old-new T61 machine with SSD. Surprisingly, the results were not what I expected; there was quite some variation and the overall boost the SSD gave over conventional disks was not that spectacular. Now, Precise Pangolin is out there, so let's see what gives. Tested: Ubuntu, Kubuntu and - a newcomer - Xubuntu. After me. 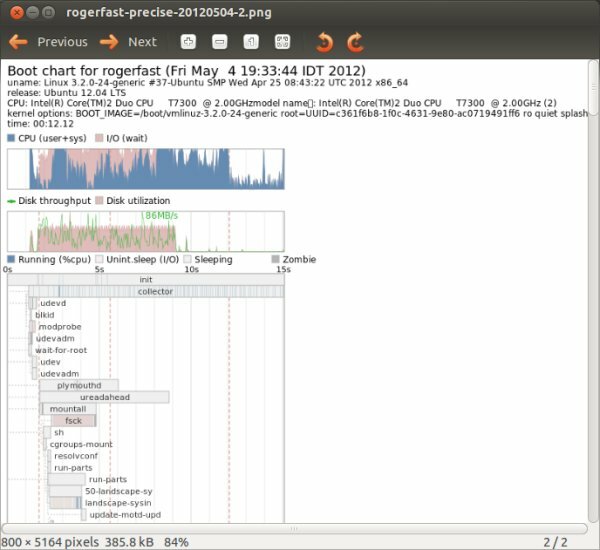 Ubuntu boot time has gone from 9 seconds up to 12 seconds, a handsome 35% degradation compared to the previous edition. Well, you will not wait long for your desktop to come up, nor does this mean that Precise Pangolin is slow, but something has changed under the hood. Rather intriguing, I'd say. Notice, I saw the same thing in Mint, which explains why Maya was slower than Lisa, absolving it of guilt. There you go, the explanation you were looking for, as promised. With Kubuntu, the results are quite the opposite. The 22-second boot interval has been shortened down to 17.5 seconds, or approx. 20% improvement. This is a nice and refreshing change. Again, probably related to the KDE framework only. Now, I'm wondering about the reported read speed. Kubuntu managed to churn data at some 100MB/sec, whereas Ubuntu only did 85MB/sec. 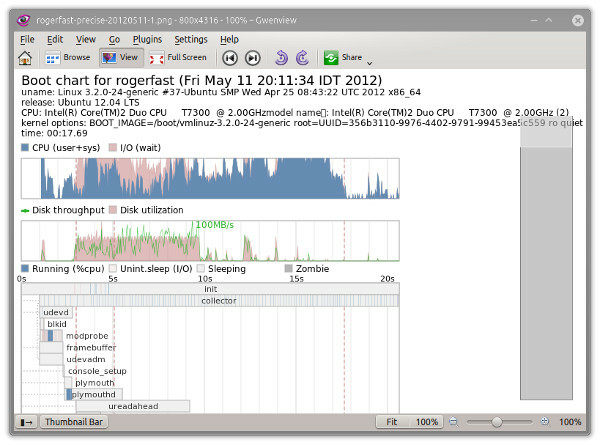 In the previous round, Ubuntu had the same throughput like Kubuntu. This could be related to how SSD manages its cells, as some people recommend writing zeros to the entire disk at least once to ensure consistent results during the use. Here, we get the biggest surprise of all - again. First, Xubuntu rocked on the desktop as a distro, which is a stunning result. But then, it also excelled in the boot process. With only 8.5 seconds, it's not only much faster than papa Boontu, it even beats the Oneiric record by close to half a second. Once again, we get some weird, but good results. The SSD does not make a revolution, we've already established that in the past. But the variation? Holy banana. The boot time ranges from 8.5 to 17.5 seconds, and that for a nearly identical trio of distributions. Ubuntu has seen a 30% drop in its boot time performance, although this does not reflect on the desktop speed in any way. Kubuntu has managed to shave 20% off its own clock, which is a good and commendable result. Xubuntu is the surprising finalist, with the best overall result of only 8.5 seconds, even slightly better than what we saw a month ago. In a way, the results stand to logic. Xubuntu is meant to favor older machines, so it should rightfully fly on a proper box with mighty hardware. Ubuntu ought to sit somewhere in the middle of the crowd. Kubuntu, being the heaviest, is the slowest here. Nevertheless, all three results are quite good. At less than 20 seconds, you're looking for a fairly short and uneventful boot process. Still, you probably didn't see this coming. Once again, reality beats statistics. I hope you liked this stupid and unneeded yet fun experiment. See you around!